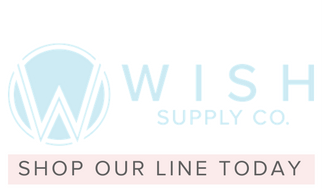 Wedding Beauty Must-Haves to Pack in your Clutch — Wish Supply Co. Besides having a long and happy marriage, one of the other priorities of your wedding day is to look your best! Not only do we want your day to be flawless, but also your makeup! We've put together a list of makeup must-haves every bride should have perfectly packed in their clutch! For fun, we have also sprinkled in some of our favorite brands for you to check out! Before applying your makeup, be sure your skin is both clean and moisturized. Using a moisturizer will ensure you don’t have flakes of dry skin showing up through your makeup. The basis for beautiful makeup is an excellent foundation. Be sure your foundation color is close to your natural skin tone so your face is close in tone to your other exposed skin. Some women prefer using a primer to ensure their foundation goes on smoothly and won’t smear. As well, some women prefer to have a spray tan for an even, smooth look. If you choose to spray tan, choose a tone that’s no more than two shades darker for a natural look. Finally, use a wet makeup beauty blender to apply your foundation, to achieve a smooth, movie star look. Hiding blemishes, scars, or imperfections in your skin tone can be done with a concealer. Different colors of concealer hide different kinds of imperfections, so if you are unsure which will work best, ask a consultant at your retailer’s makeup counter. To minimize fine lines and pores and avoid smearing and smudging, consider using a setting powder. Applied with a brush, setting powder also produces a matte finish to your makeup so you won’t appear to be shiny beneath the bright lights. They can be used together or not, but blush and bronzer create different kinds of effects on your skin tone. While blush tends to give the complexion a healthy pinkish tone, bronzer produces an outdoorsy sun-kissed look. Based on the look you want, decide on using either or both. They say “the eyes have it,” and they certainly do! Quickly, here are the four most commonly used kinds of eye makeup, each with a tip on its use: Eyebrow pencil (go one or two shades lighter to avoid a heavy look), mascara/false lashes (draw attention to the eyes, but not too much; use false lashes to avoid using mascara, which can smear), eyeliner (use a dark shade on the upper lid and a lighter shade on the bottom; liquid shows better than a waxy pencil), eye shadow (use a palette of natural tones that includes a shimmer for lid corners). Before applying lipstick use lip balm to moisturize and repair your lips, creating a smooth surface for your lipstick application. Apply lipstick to the edge of your lips then use a lip highlighter to outline. If you are worried about looking shiny at any point, consider using blotting paper to keep your makeup from smearing and to avoid any major makeup retouching throughout the day. Also, if you are prone to crying or sweating (or both) consider using waterproof makeup.